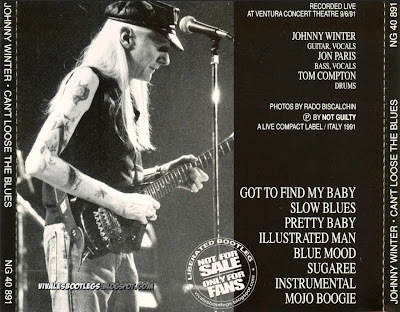 Recorded Live at Ventura Concert Theatre, Ventura, CA, USA - September 06, 1991. Files: 8. :: Size: 378 MB (flac). 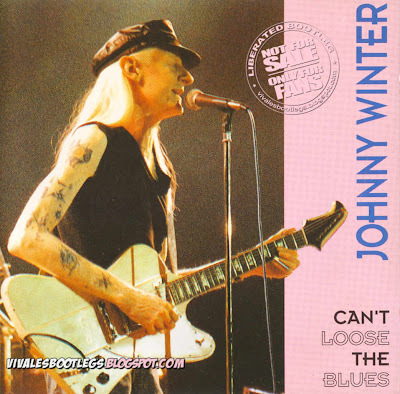 Personnel: Johnny Winter - Guitar, Vocals :: Jeff Ganz - Bass . Notes: in the end of "Illustrated Man", Jeff Ganz(bassist) announces an "old rock'n'roll song you'll recognize". The song is sang by him; "Linda Lu" from R. Sharpe. There is a fantastic version of this song performed by Left Hand Franck, a left-handed chicago blues guitarist who plays a guitar with strings upside down (for right-handed players). You can hear it on the volume 1 of the "living chicago blues" collection edited by Alligator-Sonet.<-(Info taken from www.yee.ch/winter). Johnny Winter is the King of cool. I guess it's supposed to be "Lose"... Like you lose your keys... Not, your pants are too "loose".